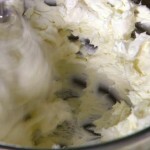 In a small bowl, cream together the cream cheese, yogurt and vanilla extract using a mixer until well blended. Refrigerate if a firmer texture is desired. Use in recipes as an inexpensive alternative to mascarpone, like the Mock Mascarpone Crostini or Individual Tiramisu.